Yoshida, Hiroshi (1876-1950) "Set details" - Scroll/Makuri roll - Chinese and Japanese woodblock prints for sale, silkscreen, scrolls, watercolor, lithographs. Artwork Details for Yoshida, Hiroshi (1876-1950) "Set details"
Condition: Right scroll: very good. Almost no soiling. Silk in fine condition. Hand painted on silk. Bone end roller. Left scroll: very good. Almost no soiling. Silk in fine condition. Hand painted on silk. Bone end roller. Middle scroll: very good. Almost no soiling. Silk in fine condition. A little wear on the verso at the very top. Hand painted on silk. Bone end roller. Notes: This is a very rare three-scene set by Hiroshi. Painted area of each scroll is 20 x 127cm. Each scroll is signed "Hiro" and sealed "Yoshida Hiroshi". See further details on each of the scrolls here, here, and here. Mount Fuji (富士山 Fuji-san, 3776 meters) is Japan's highest mountain and the focal point of the sprawling Fuji-Hakone-Izu National Park. Visible from Tokyo on a clear day, the mountain is located to the west of Tokyo on the main island Honshu, straddling the border between Shizuoka and Yamanashi prefectures. Climbing Mt Fuji and viewing the rising sun at dawn has been a custom of the Japanese for centuries. It is the desire of all Japanese to climb to the summit of Fuji and watch the rising sun at least once during their lifetime. 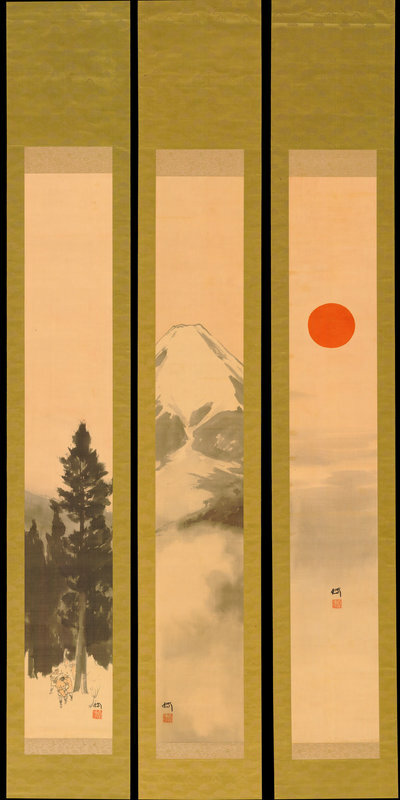 In these scroll paintings Hiroshi expresses three of the main aspects of this event: the ascent, the red rising sun viewed from the summit, and Mt Fuji in all its magnificence.